Situation when we need to calculate the percentages in our mind are quite common. While calculating the VAT, Insurance premium or Tips at restaurant, we thought of percentages or perhaps if we are earning then we would have thought about percentage of our salary we are paying for rent, food or fuel for our vehicle. These are real life situation and we are often asked in the competitive examinations. There are some percentages that are easy to calculate mentally. 50% means half, 25% means 1/4 and 75% means 3/4 . Finding 10% of a number is one of the most useful and also one of the easiest. To find 10% all we need to do is move/shift the decimal one place to the left. Thus 10% of 543 = 54.3, pretty simple! 100% is the easiest by far. The number does not change. So, 100% of 765 is the number itself i.e. is 765. 50% is just the number divided by 2. So, 50% of 444 = 222. How 5% works. It’s just half of 10%. Simply 2 steps in any order (1) Take 10% (2) Divide by 2. You can take 10% first or divide by 2 first, it does not matter. For example, 5% of 44 =? 10% of 44 is 4.4 and divide by 2 gives us 2.2. So, 5% of 44 = 2.2. Again, 5% of $24.80=? a) $24.80 -->> $2.48 (moving the decimal point one place to the left) and b) $2.48 / 2 = $1.24. 15% is just 10%+5% and we already know how to solve these. So, 15% of 24 =? 10% of 24 is, well, take the decimal to one digit left to get 2.4 and 5% is just half of 10%. So we divide 2.4 by 2 to get 1.2. So, add them up 2.4+1.2= 3.6 which is 15% of 24. 60% of 320=? 60%=50%+10%, so 50% of 320 would be 160 and 10% would be 32. So, our final answer would be 160+32 which is 192. 75% is doing the same thing-breaking it up into friendly parts/numbers. 75% of 880=? You can break it up by 50%+25%. 50% of 880 gives us 440. Now we need to find 25% of 880. Now, 25% is just half of 50% and we already solved 50%, so just take half of that. 440 divided by 2 gives us 220. Now as we broke it up, we have to put it back together. So our final answer is 440+220 =660. 95% of 2400 =? Break it up into friendly parts/numbers. So break it 2 parts- 100% and 5%. The 100% of 2400 does not change. So, 100% of 2400=2400 and 5% of 2400=? To find 5%, take 10% and then divide by 2. 10% of 2400 is 240 and half of 240 is 120, so 5% of 2400 is 120. Now as we broke it up, we have to put it back together. So, 100% - 5% =2400-120=2280. 110% of 140=? 110%=100%+10%, 100% is the number itself which is 140 and 10% of 140 is 14 so 140+14=154. We can use same breaking up techniques to solve ANY percentage problem. 17% of 300=? Break 17% into 10% + 5% + 2%. Now calculate; 10% of 300 is 30, 5% of 300 is half of 10% (i.e. 30/2= 15) and 2% (2x1% of 300 = 2x3 = 6). So it all add up to 51. 98% of 250=? 98% is 100%-2%. 100% of 250 is 250 and 1% would be 2.5 (decimal will shift 2 places towards the left). 2% would be 5. So our final answer would be 250-5 i.e. 245. There are many different ways to look at a problem. Say, 42% of 366=? 2 different ways to solve the same problem. We can do this by taking (a) 4x10% + 2x1% or (b) we can also do it a different way by taking 50% and subtracting 8% i.e. 50% - 1%x8. Both are same, both give us the same answer. a) 4x10% + 2x1%. 10% is 36.6 and 1% is 3.66. Now, 4x36.6=146.4 and 2x3.66=7.32; adding them up is 153.72. b) 50% - 1%x8. 50% is half of 366 which is 183 and 8% is 3.66x8 = 29.28; subtracting the two gives us 183-29.28=153.72, the same answer as before. 16% of 42 would be 10%+5%+1% i.e. 4.2 + 2.1 + 0.42 = 6.72. 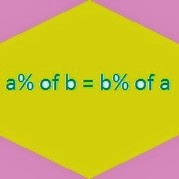 It may not be immediately clear, but it’s true: a% of b = .01 × a × b, which is the same as b% of a (.01 × b × a). What’s 43% of 200? Same as 200% of 43: 86.